An internationally-known doctor recently sparked much controversy at a popular university for his views about evolution. John Hopkins’ neurosurgeon Ben Carson was invited to give the commencement speech at Emery University in Atlanta, Georgia this past Monday. When several biology teachers at Emery got wind of Carson’s invitation, they decided to draft a letter to the university, not asking that Carson be replaced, but to rather vocalize their objections to his criticism of evolutionary theory. “Dr. Carson insists on not seeing a difference between science, which is predictive and falsifiable, and religious belief systems, which by their very nature cannot be falsified. This is especially troubling since his great achievements in medicine allow him to be viewed as someone who ‘understands science,'” the letter stated. “Accepting evolution, and the scientific method in general, are not at odds with being moral or religious, as is well demonstrated by strongly religious scientists, and political and academic leaders,” it continued. Nearly 500 students, professors and alumni signed the letter. “God has given us plenty of evidence of who He is,” Carson stated. “I’m a person of faith, so I have to believe in God. You know that always gets them,” he explained in a speech on YouTube. The professors stated that while they deeply respect the famed neurosurgeon, their greatest issue with Carson was his belief that adherence to evolutionary theory can result in moral relativism. While focusing little on evolution during his commencement address, he did use strong language for those who opposed him for his beliefs. Carson first gained notoriety in 1987 when he became the first surgeon to successfully separate Siamese twins conjoined at the head. He has since presented numerous commencement speeches and has been awarded over 50 honorary degrees. In 2008, he received the Presidential Medal of Freedom from George W. Bush. Carson was raised by his single mother, Sonja, and struggled with academics as a young boy. However, his mother encouraged him and his older brother Curtis to succeed by requiring them to submit two book reports to her per week. Little did Ben know that his mother was illiterate and only had a third grade education. The film “Gifted Hands,” released in 2009, portrays his inspiring life story. 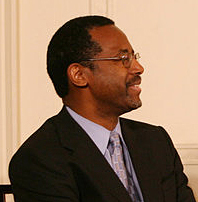 Carson has debated well-known evolutionists including Richard Dawkins and Francis Collins.